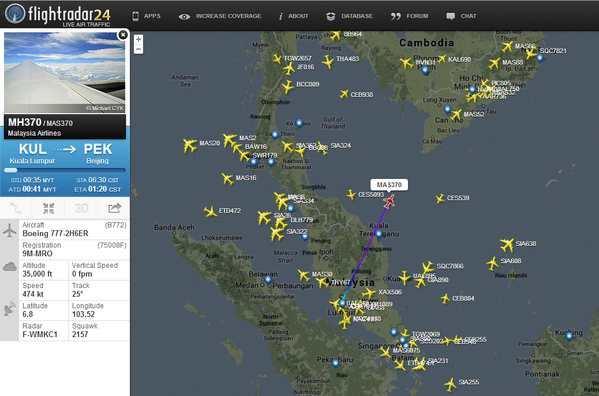 UPDATED: A Boeing 777 traveling from Kuala Lumpur to Beijing has disappeared. At least two men traveling on the plane are believed to have been using stolen passports. More than two days after Malaysia Airlines Flight MH370 first vanished, officials involved in investigating the incident say they still have no idea what could have happened to the plane carrying 239 people. Officials told Reuters on Sunday that they are narrowing the focus on the possibility that the plane disintegrated mid-flight. While searching for the still-lost airplane, Vietnam officials said they found suspected fragments of the missing jetliner, according to the Wall Street Journal. The country released a photo of the floating object, which was originally thought to be part of a door and airplane tail. However, search teams were not able to confirm any discovery of wreckage in seas beneath the plane's flight. An earlier "strange object" spotted late Sunday afternoon by a Singaporean search plane is not debris from the plane, CNN reported. The search party continues, and now includes more than 40 planes and over two dozen ships from multiple countries. A Malaysia Airlines plane carrying 239 people from Kuala Lumpur to Beijing disappeared in Southeast Asia early Saturday, and its fate was still unknown more than 24 hours later. The plane, a Boeing 777-200, was carrying 227 passengers and 12 crew members when it dropped from radar at 1:30 a.m. in the waters between Malaysia and Vietnam. Several hours after the plane was scheduled to land and there was still no sign of the flight, the airline began contacting relatives of the passengers and crew. Search and rescue crews scoured the South China Sea in hopes of locating the missing plane. Vietnam, Malaysia, China, Singapore, and the Philippines staged an intensive search for the missing aircraft, dispatching military planes, navy vessels, and helicopters to search the area for any sign of Flight MH370. The U.S. Seventh Fleet has announced USS Pinckney would join the search. Admiral Datuk Mohd Amdan Kurish, Director General of the Malaysian Maritime Enforcement Agency, looks at a radar screen while searching for a missing Malaysia Airlines plane in the South China Sea, about 100 nautical miles from Tok Bali Beach in Malaysia's Kelantan state, on March 9. "It has been more than 24 hours since we last heard from MH370 at 1:30 a.m.," the airline said early Sunday. "The search and rescue team is yet to determine the whereabouts of the Boeing 777-200 aircraft". Flight MH370 was last detected on radar 85 miles north of the Malaysian city of Kuala Terengganu, Malaysia's civil aviation chief told the Associated Press. The plane "lost all contact and radar signal one minute before it entered Vietnam's air traffic control," Lt. Gen. Vo Van Tuan, deputy chief of staff of the Vietnamese army, said in a statement. Vietnamese media claimed the plane crashed south of Phu Quoc island, but Admiral Ngo Van Phat and Malaysia's transport minister denied the report, saying wreckage had not been found. A woman believed to be the relative of a passenger on board Malaysia Airlines Flight MH370 cries at Beijing Capital International Airport on March 8. Radar signals show the plane may have turned back, Malaysian officials have said. Malaysia's civil aviation chief Azharuddin Abdul Rahman told a press conference in Kuala Lumpur that the search area has been expanded. It now includes the country's west coast. Air Force Chief Rodzali Daud said the investigation is now focusing on a recording of radar signals that shows there is a chance the aircraft turned back from its flight path. A map shows the last known position of Malaysia Airlines Flight MH370. Malaysia Airlines Vice President of Operations Control Fuad Sharuji said there was no distress call or problems reported from Flight MH370 before it vanished. The plane was traveling at 35,000 feet at the time of last communication, and weather reports showed no significant storms in the area. "At the moment, we have no idea where the aircraft is," Sharuji told CNN. The airline's CEO, Ahmad Jauhari Yahya, said at a news conference Saturday the plane was carrying 152 Chinese passengers (including an infant), 38 Malaysians, 12 Indonesians, six Australians, five Indians, three Americans (including an infant), three French, two Canadians, two New Zealanders, two Ukrainians, one Dutch, one Italian, one Russian, one Taiwanese, and one Austrian. However, on Saturday officials reported that the Austrian and Italian passengers were not actually on the plane, and that their passports had been stolen. The Italian man, Luigi Maraldi, 37, called his parents from Thailand, where he is vacationing, after discovering that his name was on the list of passengers, the New York Times reports. The official said Mr. Maraldi's passport was stolen last August, and he reported the theft to the police. The Austrian man, Christian Kozel, 30, said he had his passport stolen about two years ago, the counterterrorism official told the New York Times. U.S. officials told NBC News on Saturday that they were investigating terrorism concerns after hearing about the stolen passports. "We are aware of the reporting on the two stolen passports," one senior official said. "We have not determined a nexus to terrorism yet, although it's still very early, and that's by no means definitive." It is uncommon for one person to board a plane with a stolen passport, let alone for two to do it, terrorism analysts said. The possibility that two people may have boarded the jet with stolen passports will change how U.S. officials look at the incident. Malcolm Moore, China correspondent for the Daily Telegraph, claims that the men holding the stolen passports bought their tickets together. According to The Guardian, both passengers used Thai baht to purchase their travel tickets on March 6, a day before the flight took off from Kuala Lumpur destined for Beijing. The paper reports: "The pair, who booked tickets with consecutive numbers, were due to fly to Beijing, then wait for around 10 hours before flying to Amsterdam. Once they arrived in Amsterdam, one of the passengers was due to travel on to Frankfurt and the other to Copenhagen." Interpol has confirmed at least two passports were stolen. It announced that it was examining "additional suspect passports" used to board the plane. The international police agency said it was of "great concern" that stolen passports were used and that no checks of its database had been made. [It} is clearly of great concern that any passenger was able to board an international flight using a stolen passport listed in Interpol's databases.[... ]This is a situation we had hoped never to see. For years Interpol has asked why should countries wait for a tragedy to put prudent security measures in place at borders and boarding gates. The plane departed Kuala Lumpur at 12:41 a.m. Saturday and was expected to land in Beijing at 6:30 a.m. Saturday, the airline said several hours after the plane's expected arrival. The flight was piloted by Capt. Zaharie Ahmad Shah, 53, a Malaysian. Shah has a total flying time of 18,365 hours and has worked for the airline since 1981, Yahya said. An official at the Civil Aviation Authority of Vietnam told Reuters the plane had failed to check in as scheduled at 1721 GMT (12:21 p.m. ET) while it was flying over the sea between Malaysia and Ho Chi Minh city. "Its code didn't appear in our system," Bui Van Vo, the CAAV's flight control department manager, told Reuters by phone. 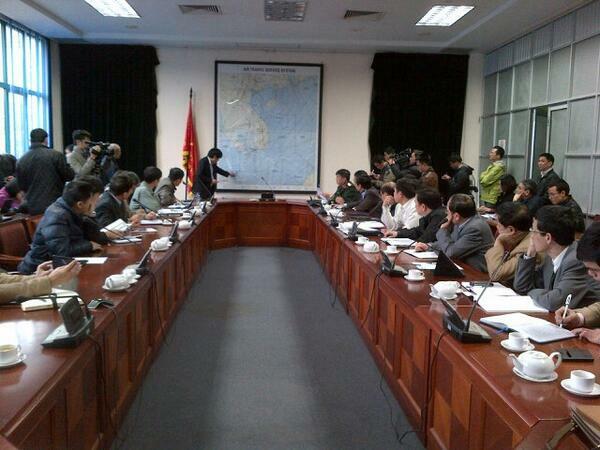 China's foreign ministry spokesman Qin Gang released a statement saying, "We are very concerned learning this news. We are contacting relevant authorities and are trying to confirm relevant information." If Flight MH370 crashed, it would mark the second fatal accident involving a Boeing 777 in less than a year after Asiana Airlines Flight 214 crashed upon landing at San Francisco International Airport last July. If there are no survivors, it would be the world's deadliest plane crash since February 2003. Vietnamese search-and-rescue vessels investigated a suspicious floating object spotted 100km south-southwest of Vietnam's Tho Chu island, but it was not the plane. The New York Times quoted Lai Xuan Thanh, the director of the Civil Aviation Administration of Vietnam, as saying there was an oil slick about 12 miles long spotted that may be a sign as to where the plane crashed: "An AN26 aircraft of the Vietnam Navy has discovered an oil slick about 20 kilometers in the search area, which is suspected of being a crashed Boeing aircraft — we have announced that information to Singapore and Malaysia and we continue the search." However, boat searches did not find any debris. Together with all those affected by the MH370 incident, we understand the need to provide regular updates on the progress of the search and rescue operations. As the hours turn into days, we at Malaysia Airlines are similarly anxious and we appreciate the patience, support and prayers from everyone. We however acknowledge that the most affected group in this incident is the families of those on-board. As such, our primary focus at this point in time is to care for the families. This means providing them with timely information, travel facilities, accommodation, meals and emotional support. Initial financial assistance has been given out to all families. Caregivers are already assigned to each family and they are trained staff and volunteers from Malaysia and Australia.Family members of the MH370 passengers from Beijing who wish to travel will be flown in stages to Kuala Lumpur on the available flights. We are also communicating with the families from other nations to similarly arrange for their travel to Kuala Lumpur. In the event flight MH370 is located, a Response Control Centre (RCC) in the area will be activated to support the needs of families.The airline continues to work with the authorities and we appreciate the help we are receiving from all parties during this critical and difficult time. Malaysia Airlines' vice president of operations spoke to CNN about the missing plane. We&rsquo;re closely monitoring reports on Malaysia flight MH370. Our thoughts are with everyone on board. Weâ€™re closely monitoring reports on Malaysia flight MH370. Our thoughts are with everyone on board. File: A Malaysia Airlines Boeing 777-200ER is seen at Narita Airport near Tokyo, Japan.